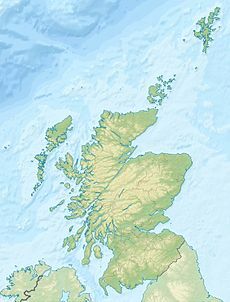 The 1921 Open Championship was the 56th Open Championship, held 23–25 June at the Old Course in St Andrews, Scotland. Former local Jock Hutchison won his only Open Championship, in a 36-hole playoff over amateur Roger Wethered. It was Hutchison's second and final major title. Qualifying took place on 20–21 June, Monday and Tuesday, with 18 holes on the Eden Course and 18 holes on the Old Course; the top 80 and ties qualified. Jock Hutchison led the field on 146; the qualifying score was 161 and 85 players advanced. The entries included an unusually large number of U.S.-based players following a funding-raising campaign by an American golf magazine. On September 27, 1920 Golf Illustrated wrote a letter to the Professional Golfers' Association of America with a suggestion that a team of twelve to twenty American professionals be chosen to play in the British Open, to be financed by popular subscription. At that time no American golfer had won the British Open. The idea was that of James D. Harnett, who worked for the magazine. The PGA of America made a positive reply and the idea was announced in the November 1920 issue. The fund was called the British Open Championship Fund. By the next spring the idea had been firmed-up. A team of 12 would be chosen, who would sail in time to play a warm-up tournament at Gleneagles (the Glasgow Herald 1000 Guinea Tournament) prior to the British Open at St Andrews, two weeks later. The team of 12 was chosen by PGA president George Sargent and PGA secretary Alec Pirie, with the assistance of USGA vice-president Robert Gardner. A team of 11 sailed from New York on the RMS Aquitania on May 24, together with James Harnett, Harry Hampton deciding at the last minute that he could not travel. The American team was: Jim Barnes, Emmet French, Clarence Hackney, Walter Hagen, Charles Hoffner, Jock Hutchison, Tom Kerrigan, George McLean, Fred McLeod, Bill Mehlhorn, and Wilfrid Reid. The day before the Glasgow Herald Tournament, a match was played between the Americans and a team of British professionals, the first match between American and British professionals. It was a forerunner of the Ryder Cup matches, which began six years later in 1927. After the Glasgow tournament, most of the American team travelled to St Andrews to practice, however, Walter Hagen and Jock Hutchison played in a tournament at Kinghorn on June 14 and 15. Hagen had a poor first round and didn't turn up for the second day, while Hutchison scored 74 and 64 and took the £50 first prize. The American-based entry was augmented by two other professionals, Jack Burgess and James Douglas Edgar, and some amateurs, including Bobby Jones. All the American-based professionals qualified with the exception of Wilfrid Reid, who scored 163. Two of the amateurs qualified, Bobby Jones and Paul Hunter. ^ The 10th hole was posthumously named for Bobby Jones in 1972. During the first round on Thursday morning, Hutchison made a hole-in-one at the 8th and then drove the green at the par-4 9th, his ball settling inches from the hole. He finished with a round of 72 and a two-shot lead, and continued to lead after 36 holes at 147, a shot ahead of Jim Barnes and Ted Ray. In the two-day format, there was no cut after 36 holes. After the third round on Friday morning, Hutchison trailed Barnes and Sandy Herd by four shots, but both co-leaders shot 80 in the final round and fell into a tie for sixth with five others. Wethered, a student at Oxford, carded 71 to finish at 296, while Hutchison shot 70 to tie and force a Saturday playoff. Wethered almost did not make it to the playoff, as he was scheduled to play for his cricket team that day and had to be persuaded to stay and play golf. In the playoff, the first two holes were halved before Hutchison gained two shots at the 3rd. However he played a poor 4th hole and took six to make the match all square again. Hutchison took a grip on the match by scoring four threes from the 7th to the 10th while Wethered took four fours. At lunch, Hutchison held a three shot lead. In the afternoon, Hutchison struggled at the first three holes but managed to halve the holes with Wethered. The match then turned decisively with Wethered taking six at the 4th and Hutchison taking threes at the 5th and 6th. Wethered dropped another shot at the 7th and now Hutchison was nine strokes ahead. Hutchison was in trouble at the 11th and took five but Wethered three-putted and only gained one stroke. Thereafter, Hutchison's lead increased to twelve before his cautious play at the final holes reduced the lead to nine. Although a native of St Andrews, Hutchison had become a U.S. citizen and was credited as being the Open's first American champion. The Times reported under the headline "Cup Goes to U.S.A." that "our Open Championship goes for the first time in its history to America." The following year, Hagen became the first U.S.-born winner. Bobby Jones, 19, played at St Andrews and the Open for the first time, and was the low amateur after 36 holes. He withdrew in the third round after taking four shots to get out of a bunker at the 11th. Armour (315), Murray (316), Harris (322), Quilter (327). ^ a b c d e f "Media guide". The Open Championship. 2011. p. 118. Archived from the original on 18 April 2012. Retrieved 4 June 2017. ^ a b "Golf championship - Jock Hutchison wins". Glasgow Herald. 27 June 1921. p. 12. ^ a b Steele, John (26 June 1921). "Jock's mashie too deadly for John Bull". Chicago Sunday Tribune. p. 1, sec. 2. ^ a b "Jock Hutchison, Chicago professional golfer, wins British Open golf championship". Milwaukee Journal. Associated Press. 25 June 1921. p. 6. Retrieved 19 May 2013. ^ "Open Championship - qualifying rounds to-day". Glasgow Herald. 20 June 1921. p. 4. ^ "The qualifying rounds - overseas men leading". Glasgow Herald. 21 June 1921. p. 11. ^ "Open Championship - the qualifying rounds". Glasgow Herald. 22 June 1921. p. 6. ^ "Hutchinson sets course mark in Scotland meet". Chicago Daily Tribune. Associated Press. 22 June 1921. p. 22. ^ a b "Open Golf at St. Andrews - The Returns". The Times. 22 June 1921. p. 6. ^ "U.S. Professionals to Seek British Title" (PDF). Golf Illustrated. November 1920. p. 27. Retrieved 6 August 2013. ^ "Month at a Glance" (PDF). Golf Illustrated. March 1921. p. 32. Retrieved 6 August 2013. ^ "Gleneagles - The Glasgow Herald golf tournament". Glasgow Herald. 26 May 1921. p. 7. ^ "Month at a Glance" (PDF). Golf Illustrated. May 1921. p. 32. Retrieved 6 August 2013. ^ "Golf Stars Leave for British Links" (PDF). The New York Times. May 25, 1921. Retrieved 6 August 2013. ^ "Gleneagles - America v. Britain". Glasgow Herald. 6 June 1921. p. 7. ^ "Gleneagles - International golf". Glasgow Herald. 7 June 1921. p. 12. ^ "Gleneagles - Mitchell's win". Glasgow Herald. 13 June 1921. p. 11. ^ "Golf – Kinghorn tournament – Hutchison's easy win". Glasgow Herald. 16 June 1921. p. 11. ^ "Day's respite spent by Yanks in practice on St Andrews links". Chicago Daily Tribune. Associated Press. 23 June 1921. p. 16. ^ "Golf Championship - Old Course". Glasgow Herald. 24 June 1921. p. 14. ^ "Golf championship - Jock Hutchison leading". Glasgow Herald. 24 June 1921. p. 14. ^ Lambert, Ambrose (24 June 1921). "Hutchinson scores one and two to top play in British Open". Chicago Daily Tribune. p. 20. ^ "Hutchison is tied for big golf honors". Milwaukee Journal. Associated Press. 24 June 1921. p. 25. Retrieved 19 May 2013. ^ "Golf championship - a day of sensations". Glasgow Herald. 25 June 1921. p. 9. ^ "Hutchinson ties up British Open title". Chicago Daily Tribune. Associated Press. 25 June 1921. p. 16. ^ a b c "Historic Golf Final - Cup Goes to U.S.A - A True St. Andrews Winner". The Times. 27 June 1921. p. 10.